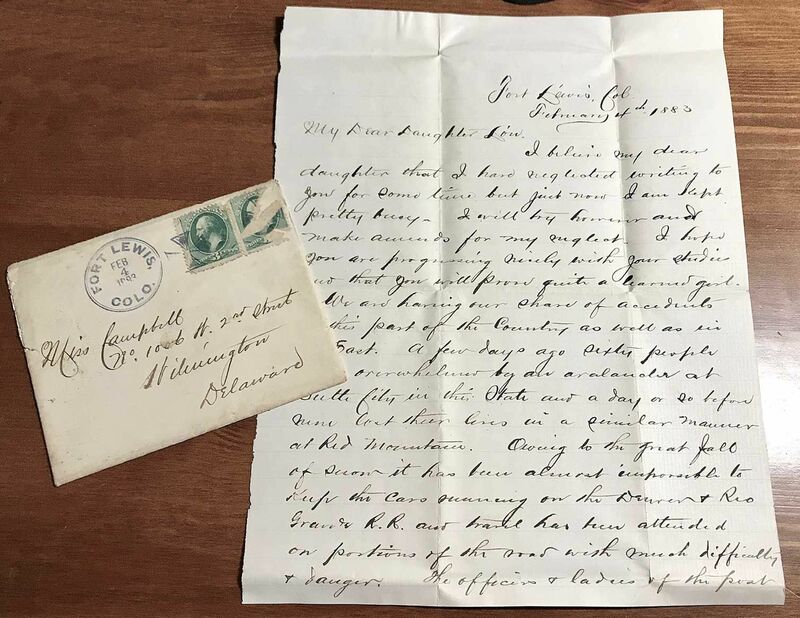 1883 Fort Lewis, Colorado officer letter. Written By Lt. William J. Campbell of the 22nd US Infantry, who writes to his daughter. Original cover is included. Both are in fine condition . Fort Lewis was a US Army post in southwest Colorado that operated from 1878 to 1891. The post had two locations: the first, Camp Lewis, in Pagosa Springs and the second south of Hesperus. Camp Lewis was founded in 1878 and moved to Hesperus in 1880 because Pagosa Springs was too far from the Ute and Navajo Reservations, and citizens in southern Colorado and northern New Mexico feared the Utes, especially after the White River Agency confrontation in 1879. The Hesperus post was completed in 1881. The garrison was home to several infantry and cavalry units, but troops from Fort Lewis did not take part in any major battles. In 1890, with relative peace between white citizens and Native Americans, the troops began moving out of Fort Lewis. It served temporarily as the Ute Indian Agency and became an Indian Boarding School after it was decommissioned in 1891. Fort Lewis is unique because the land and real property have remained in public trust, allowing for its survival to the present and use as a significant historical resource. Pagosa Springs In mid-October of 1878, under the command of Captain William Hartz, troops from the Ninth Cavalry (D Troop) and the Fifteenth Infantry (I Company) made their home on a bench above the San Juan River in southwest Colorado near large mineral springs. The springs were a sacred place to the Ute tribe that made this part of southwest Colorado their home. They called the place Pagosa, meaning “stinking waters” or “water that smells like sulfur.” This cantonment (a temporary fort) on the San Juan River was initially called Pagosa Springs, but the name was later changed to Camp Lewis. Lt. Colonel William Lewis, for whom the fort was named, was an accomplished soldier and Native American sympathizer. He died from a severed femoral artery in a surprise attack by the Cheyenne at Punished Woman’s Fork on the Smoky Hill River in Kansas. The Ninth Cavalry, the larger of the two regiments, were Buffalo Soldiers, black regiments consisting of former slaves and free blacks. The Pagosa garrison never became anything more than a cantonment. In September 1879 an unfortunate sequence of events at the White River Agency in northwest Colorado culminated in the death of Indian agent Nathaniel Meeker and angered the citizens of Colorado, who threatened revenge on the Ute Indians. To address the potential for an uprising, the army initiated the move from the Pagosa Springs garrison. The isolated post along the San Juan River was too far from any major Anglo-American settlement it had been commissioned to protect. It was also too distant from the Ute and Navajo reservations. Move to Hesperus In the summer of 1880 troops were moved to a location along the La Plata River just south of Hesperus, near the fast-growing communities of Durango, Animas City, and Silverton. A temporary cantonment about a mile upstream of the proposed fort was set up with tents, a sawmill, and a shingle mill. Harsh weather and poor living conditions in the temporary encampment exacerbated unrest and troubling health conditions among the troops. The first trooper to die at the Hesperus cantonment was Private Frederick Beehler of the Thirteenth Infantry, who succumbed to pneumonia on November 18, 1880. Despite a miserable winter with most of the troops housed in temporary tents, the new post was officially designated as Fort Lewis on January 21, 1881. It was located on the second terrace along the west bank of the La Plata River. The cavalry stables, blacksmith shop, employee quarters, and facilities were located along the riverbanks. The cemetery was positioned on the first terrace of the La Plata River, but at a distance east of the post. Buried together in this cemetery were members of the military and their families, along with civilian employees. Over the ten years of operation at Hesperus, Fort Lewis was home to the 6th, 13th, 15th and 22nd Infantries and the 6th Cavalry. The Twenty-Second Infantry was under the command of Lieutenant Colonel Peter Swain. In August 1883 two companies of Buffalo Soldiers camped in close proximity to Fort Lewis on their way to Fort Craig, New Mexico. Troops at Fort Lewis participated in no major battles, and only a few skirmishes demanded their attention. Perhaps the most significant of these was a sortie into the Abajo Mountains of southeastern Utah. Troops arrested an Indian accused of killing a local rancher, but this incident did not result in a battle. The post briefly served as the Southern Ute Agency headquarters until a full service agency was established at Ignacio. An excursion to the Grand Canyon from Fort Lewis was led by First Lieutenant Edward Wanton Casey of the Twenty-Second Infantry. The purpose was to explore the lands of the Moqui, Navajo, and Pueblo Indians thought to be of possible military interest and to provide better geographical and topographical knowledge of the land. The party left Fort Lewis in November 1887 and returned in January 1888. They reached the Grand Canyon ten miles below the mouth of the Little Colorado River but never reached the canyon’s north side. One member of this expedition was Private Christian Barthelmess, a noted musician and photographer. Christian Barthelmess served several terms with the US Army and was stationed throughout the west. He was intrigued with the Native Americans and took hundreds of photographs, many of them now housed at the Montana Historical Society. He took most of the photographs of the Fort Lewis post near Hesperus. Maurice Frink’s Photographer on an Army Mule with Casey Barthelmess documents the story of Christian Barthelmess as he photographed the western frontier during the closing years of the nineteenth century. End of the Fort With relative peace between the Utes and Navajos and the white settlers, Fort Lewis was decommissioned in September 1891 and troops from the Twenty-Second Infantry left for Fort Lyon, Colorado, before continuing on to Fort Kehoe, Montana. The land and the buildings were transferred to the secretary of the interior, Department of Indian Education, to be used as an Indian boarding school.